No BS. 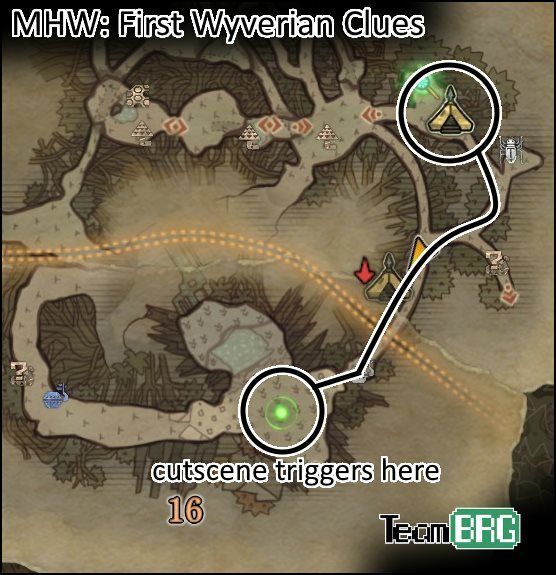 Finding the First Wyverian Clues. Here’s a really short guide with a certain quest objective in Monster Hunter World – ‘Search the Ancient Forest for First Wyverian Clues’. If it annoyed me a little there’s quite a likelihood that others felt my pain here too. Here goes. Enter the Ancient Forest via Expedition: which means just plainly going to the Ancient Forest without a quest. Don’t have the Ancient Forest Camp (17)? Get it now. Head towards the dragon roost (the usual nesting ground of Rathalos, Rathian, and Kushala). You’ll find your handler here. It’s south / southwest really nearby from the Ancient Forest Camp (17). I have a picture below. You’ll get a cutscene with Rathalos – which has a set spawnpoint at the dragon’s nest. Tada! You’ll find the First Wyverian after the cutscene! The quest objective transforms into “Hunt a Rathalos“, feel free to return to base first. While you’re here, I may as well give you a few tips on Rathalos. Flash Pods are your friend, just like against any flying monster. Severing its tail heavily reduces the threat of its tail based attacks. Breaking its head seems to cause fire-based attacks to “misfire”. Breaking wings makes it a little less agile in the air – although I have no proof on this. YOU DO NOT Have to beat up Rathalos right now! You can go back to base. The main quest advances, requiring you to complete two different assigned quests, “A Fiery Throne Atop the Forest” and “Horned Tyrant Below the Sands” – to defeat Rathalos and Diablos, respectively. Well, hopefully that helped you out! See our other MHW Guides!